Chef Laura Apshaga, owner of From Scratch, finds inspiration for her cooking from local farmers and seasonal ingredients. Creating delicious food has been Laura's passion for many years, but in recent years, she has doubled down in her commitment to sourcing locally and organically produced food. Believing fully in the "buy local" movement, Laura praises our farmers and their customers. 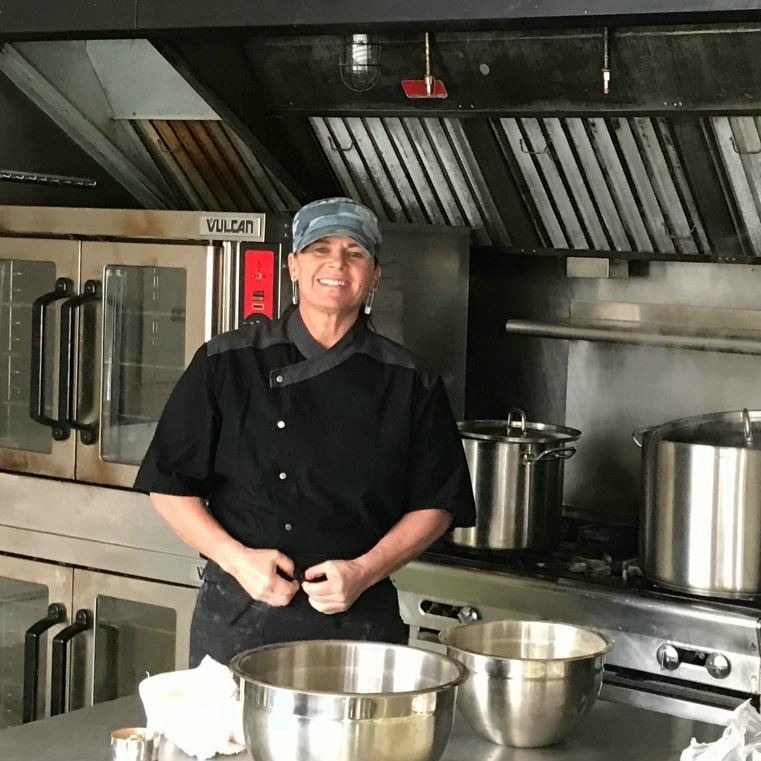 She hopes to raise awareness for local food by offering her high quality, handcrafted soups, salads and other wholesome edibles (available through Kraay's Market & Garden) to valley residents. ‍I have always loved to cook! Even as a kid, I would watch my mom in the kitchen. Growing up, my mother was the foundation of the family meal in my house. We had the evening meal as a family, following the afterschool homework and sports. We also had a Sunday dinner in the mid-afternoons, sitting around the table after the meal was over, drinking a pot of tea, trading stories and ideas. Both my father and mother also loved to have a vegetable garden, growing a good portion of diverse foods from green beans, corn, tomatoes and other veggies as well as my dad’s coveted fruit trees….peaches, plums, cherries and apples (which he used to graft for his own personal variety). Mom used to can and preserve the garden bounty so we could have garden green beans and applesauce all winter! Cooking with what was in season was more popular because the stores stocked what was grown locally. Food brings people together, creating feelings of well-being and memories that last a lifetime…..and THAT is what drives me to do what I do! Over the years, I have been asked the question of how I can make something taste so good. My answer always begins with by using the best ingredients I can find…..and that means using vegetables, meats and dairy that were grown in a way that preserves the nature of what is grown. If food has to travel across the country or the continent to get to you, quality is going to suffer. Supporting our local growers is the first and most important link in the food chain that connects us all together! Without diverse growers on the local level, we are held hostage by a handful of agribusinesses, controlling the food system, shaping what is and is not available to the consumer, pushing heavily processed “convenient” foods that are artificially priced low so as to appeal to your pocket book. My go-to meal at home is what my husband lovingly refers to as “Scrapple”…..a one-pan meal of whatever meats, veggies and grains, beans or potato left in my kitchen after a day of restaurant cooking…..it usually includes garlic and onion from Prairie Winds in Fairfield as a base; throw in some ground beef from Spike Diamond Ranch in Bellevue; kale, spinach, beet greens or chard from Kraays; Agrarian Harvest squashes, potatoes or beans and some of my bone broth and finish with a pat of Irish butter, and we are in Heaven! I would have to say an artichoke. They are a little prickly to handle, have many layers, the heart is complex but tastes great dipped in butter or mayo, and when left alone, they blossom to the most beautiful flower you could imagine! I believe chefs need to take the time before the growing season is in full tilt to have a running conversation with their local farmers to let them know AHEAD of time what products they will be wanting for the upcoming seasons, and what they will need for consistency in product and delivery. Chefs and customers also need to be creative in using what IS available, not what is TRENDY on the Food Network and in all those magazines. Making time for each other and face to face meetings at the farmers’ markets builds relationships that will last a lifetime! Take advantage of the farmers’ markets, food festivals or go visit a working farm and join a CSA. It is the BEST relationship you can make! Like ALL food-related trends, being informed is how you can sift through all the newest food crazes out there. Although organic USED to means something, with the food labeling and FDA rules changing, the waters have become muddied. I suggest educating yourself on what organic means, what certified organic means and realize many of our local food producers use organic practices to grow their foods, but do not have the spare money it takes to PAY the government for that certification. It behooves all of us to ASK questions and READ labels carefully….read your ingredients lists! And yes, I only buy organic labeled foods if I cannot source the product from someone I know. My ABSOLUTE food hero is actually a family….John and Becky Klimes and their children Lizzy, Jacob and Kylee are my number one, without a doubt, heroes !! They are a small operation growing a diverse amount of products from beef, pork, ducks, chicken and eggs to green beans, squashes, potatoes, okra, tomatoes etc. They are generous to a fault, hardworking beyond what your normal human can do, and they do it because they love it and they do it as a family. They simply want to produce amazing food and it is evident if you have ever had any of their products or met them in person. They are involved in their community and ours and work tirelessly to provide this area with awesome, CLEAN food!!! My main concern is the far-reaching use of chemicals and the non-regenerative farming and ranching practices by the agribusiness that are gobbling up the small farmer/rancher. Huge feedlots, massive dairies, animal crowding and unhealthy practices by these conglomerates companies. They are poisoning our water and decimating our soil. The small farmers who are using integrity are struggling to make ends meet while the big food corporations are hopping on the “organic” wagon, buying smaller companies, compromising the original product and idea, only to double dip by offering cheap processed food while touting their contribution to the ‘organic” cause. I would love to see more AWARENESS in the Wood River Valley. These producers are not getting rich coming up to the Valley to sell their products to all of us at the farmers’ market. I have heard one too many times how “EXPENSIVE” it can be to buy their products. We have grown so far apart from where our food comes from that we have forgotten what it takes to actually produce it. The convenience craze in this instant “Amazon Age” as well as the artificially low pricing from these conglomerate food czars has tainted what we feel we should be paying for EVERYTHING. We need to get back to Main Street and shop local. Local dollars spent stay local, whether we are talking about food and farmers or buildings and builders.